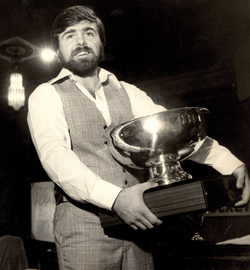 Hopkins bowled over Pete Margo, 200-55, at the 1977 World Open to take home his first major title. But it was much more than weekends in New Jersey that defined Hopkins' playing career. Hopkins jokingly refers to himself as "a Filipino before the Filipinos ever got here." "I was on the road matching up and making games all the time," Hopkins declared. "And I mean all the time. Playing pool was my business back then, and I took it very seriously. I played for money every single day. It was the way I made my living." "I was a real gunslinger," Hopkins once said. "If you wanted to gamble, we could play. I didn't care who you were." And to be able to match up against anyone, Hopkins had to be prepared to play any game. Already an accomplished straight-pool and 8-ball player, he became one of the game's top one-pocket players. He also became one of the premier game-makers. "I just had an instinct that allowed me to quickly determine what the right game was," Hopkins said. "Players always said I was giving up too much weight, but I always knew how to make the game seem one-sided." "Allen gave great games to players," said Hall of Famer Buddy Hall in concurrence. "And he could do it because he was such a smart player. He never lost the game shooting. You had to beat him to the shot. "I remember Allen giving Efren [Reyes] a ball playing one-pocket when no one even thought of giving Efren weight. And he'd win." "I was a pretty solid 9-ball player," recalled Mike Zuglan, an East Coast star from Albany who knew Hopkins by reputation long before they'd ever played. "And the first time we played, Allen gave me the 7 and I never won. But I learned a lot about how to move and play better safeties playing Allen. "I also learned how to conduct myself at the table watching Allen," Zuglan added. "He was always in control. Never too high, never too low." Zuglan, who promotes tournaments on the East Coast, including the Turning Stone Casino Classic, said he also respects Hopkins as a businessman. "I know how hard it is to be a promoter," Zuglan said. "He does a great job with the Super Billiards Expo. And he always wishes me well, which not many promoters do." Hopkins generally credits his steady demeanor to lessons learned on the road, where his philosophy was to never argue with an opponent, and never use any lip. "Just win softly and move on," he cautioned. And he credits his smarts on the table to the great players he was fortunate enough to find in his own back yard. "I learned so much watching and playing the great players who were all along the East Coast," he said.